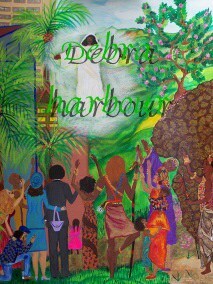 Debra Harbour’s love for art started when she was a teenager. She started designing purses and jewelry. Her medium is leather and mud cloth that is native to Africa, and exotic glass and ceramic beads. Every piece of jewelry is one of a kind. Debra uses only the finest of beads such as Amber, imported African and Asian beads, and semi precious stones of various kinds. Eventually, Debra began to develop a passion for drawing and painting. Debra has been painting for several years. Her main focus is African American folk art, and general folk art using acrylic paint, oils and watercolors. Debra’s love for art eventually graduated into works on canvas, and commissioned book covers for publishing companies and private collections. 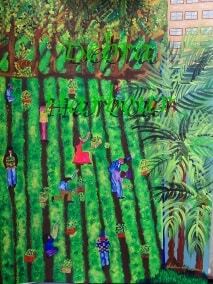 Debra’s paintings depict scenes that are common in our everyday experiences. From something as simple as a lady standing over her stove cooking fish for the weekly fish fry party while her two cats look on in anticipation, in her painting “Saturday Night Fish Fry”, to a more complex and detailed painting entitled “Confidential” depicting a group of girlfriends sitting around doing what girlfriends love to do, gossip! Debra Harbour’s paintings range in emotion from the whimsical and funny, to the serious. A new gallery has been added!! Poetry and live music brings a warm atmosphere for Debra's artistic expressions. She was warmly accepted five times at this location. Debra was invited to set up her artwork at this occasion to bring awareness to local artists. Debra's art is featured on this web site as Buttafly Jonez Co. logo. Debra was commissioned to develop and execute book covers for published poet's books when the same website was known as Buttafly Jonez Publishing Co.
A juried art show. Held annually. Both submissions were chosen for the show. A featured artist. This art exhibit was hosted by the Linx Organization of Southern California. 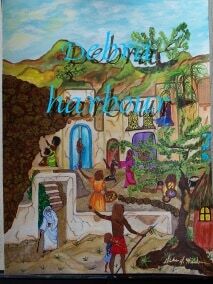 Debra's artwork has been commissioned and has been sold to private art collectors.